Women today need to balance it all. Their dreams, aspirations whilst keeping in touch with their roots and traditions so that they can carry it forward and teach the next generation. To maintain her balance and sanity a woman must get equal help and recognition and strength from her partner and family alike. In between such complexities of life comes a festival celebrated by the womenfolk which may or may not be for the menfolk, yet carries a lot of religious as well as social importance- Teej. Teej Festival – Teej is one of the most sacred Hindu festivals observed in India and Nepal. It is widely believed that Teej gets its name from a small red insect called ‘Teej’ that pops up during the monsoons. The festival marks the beginning of monsoon. Teej also means third. Therefore Teej falls on the third day after Amavasya (new moon) and the third day after the full moon of every month. Legend also has it that Teej is celebrated to honor the devotion of Ma Parvati who underwent penance for years to become the significant other of Shiva. 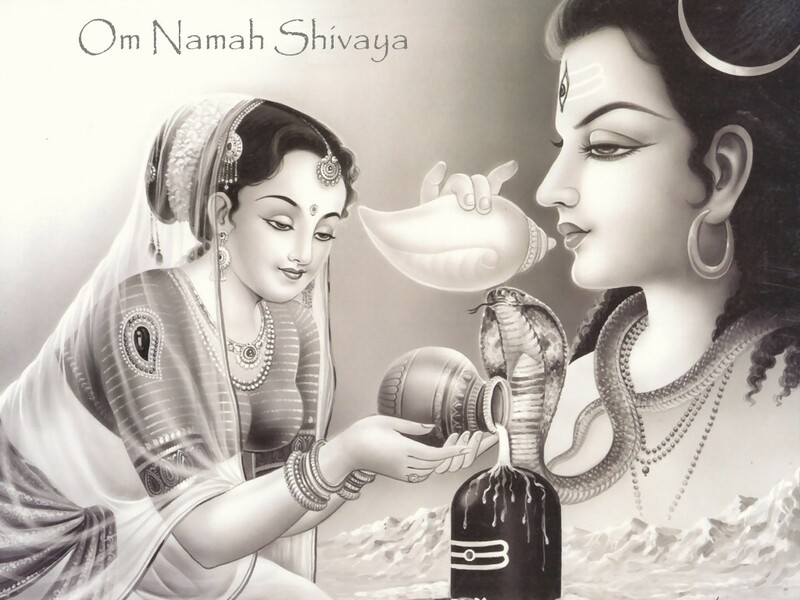 Women seek her blessings for a happy married life and unmarried girls fast to attain an exemplary husband like Shiva. There are three types of Teej celebrated in India. These are Hariyali Teej, Hartalika Teej, and Kajri Teej. The Hariyali Teej is also known as ‘Chhoti Teej ’held in the Shravana. This is followed by Kajari Teej also called ‘Badi Teej’, held after fifteen days of Hariyali Teej. 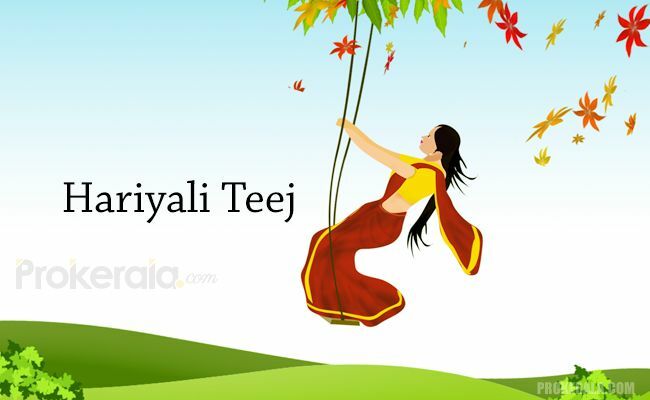 The third type of Teej, Haritalika Teej falls in the ‘Bhado’ month and is held almost a month after Haryali Teej. Though customs may differ from state to state, the unifying factor is that women of all state seek the blessings of marital happiness and long life of their husband. Hariyali Teej falls during Shrawan month, which is the holy month to observe various fasts devoted to Lord Shiva. For the followers of Shiva and Parvati, the month and the festival holds a very significant position. Traditionally, ghevar (or ghewar), a Rajasthani sweet, is commonly associated with the celebrations. 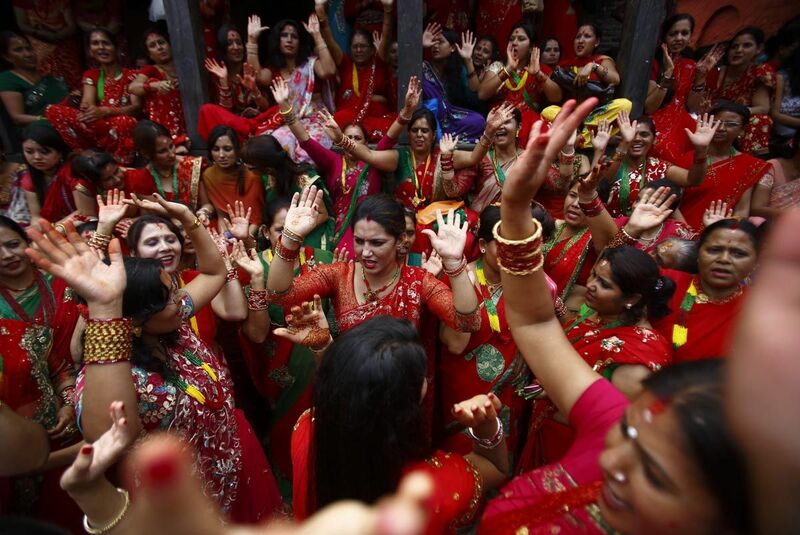 Married women gather and worship Goddess Parvati for a happy married life. Some visit their parents’ home and adorn themselves in new clothes and accessories like red or green saris, green bangles, etc. Huge swings are decorated for women who swing while singing traditional Teej songs, followed by Teej folklore, usually narrated by older ladies. In certain traditions, Sindhara, a bucket of gift, is sent to the daughter and her in-laws by her parents. 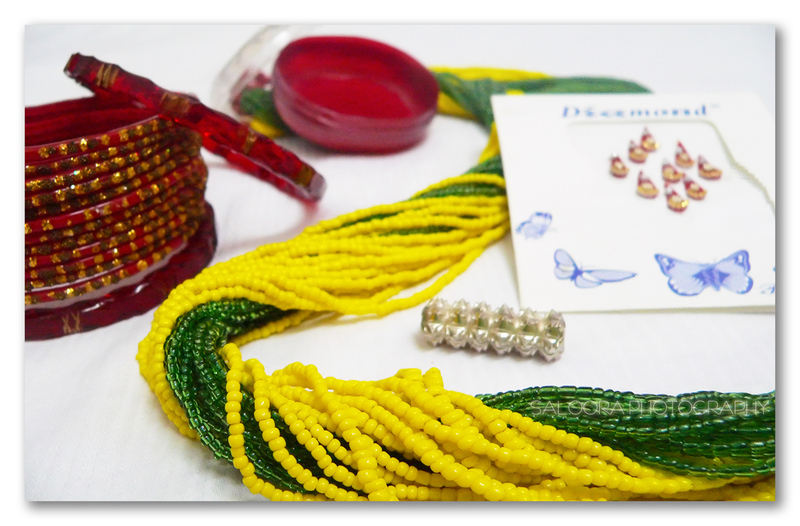 Sindhara contains home-made sweets, ghewar, henna, bangles etc. The custom of gifting sindhara to the daughter and her in-laws during this Teej also gives the festival the name of Sindhara Teej. Married women keep a day long nirjala (no-food-no-water). The fast is finally broken after offering prayers to the moon in the evening and worshipping Lord Shiva and Goddess Parvati. Many unmarried women also keep the fast, take part in the festivities and pray for a blissful married life. Haryali Teej is pre-dominantly followed in Rajasthan, Madhya Pradesh and Maharashtra and also in some parts of Haryana, Punjab and Bihar. Kajari Teej is counted amongst the four of the important Teej festivals that occur in a year. As per the Hindu Calendar, the day of Kajari Teej falls on the third day of the Krishna Paksha (dark fortnight) in the Hindu month, Bhadrapada. Kajri Teej gets its name from the blackish hue of clouds that signal the onset of rains. As per the legend, there used to be a dense forest named Kajali located in Central India. The ruler of the region was King Dadurai. King’s subjects used to sing songs, which were named as Kajali. The songs were also named as Raga Kajari. The King of that place had a sudden death and the subjects sang those songs in the form of sorrow and grief. When the King died, his wife also became Sati (an old ritual of burning alive with the husband’s body) with him. So, the people of the place sang those songs in remembrance of their King and Queen. These songs became famous in the form of separation songs. Since, the Kajari Teej also marks the start of monsoon season; hence, Kajri Teej songs are also sung on this day to welcome the monsoon showers. These songs are famous usually in North India. The devotional angle of celebrating the Kajari Teej festival is connected to Lord Shiva and Goddess Parvati. The legend says that Goddess Parvati wanted to marry Lord Shiva, but he was in grief of separation from Sati. He went to the caves and involved into deep meditation. While, Goddess Parvati wanted Lord Shiva as her husband and for this, she prayed with full dedication and devotion for a long span of 108 years. Hence, Lord Shiva became happy with her devotion and accepted her as his wife. So, on this Kajari Teej, you are also getting a chance to please Lord Shiva and Goddess Parvati. Earn their blessings by worshiping them and get your wishes fulfilled by their grace. So, follow the rituals of this Kajari Teej while observing the Kajali Teej Vrat (fast). The rituals are same as for the other Teejs. On the occasion of Kajri Teej, married women visit their parents’ place. The Nirjala Vrat is observed on the occasion of Kajari Teej by the females for the longevity of husband’s life. Women dress up in their best attire including all the Shringara items namely – bangles, Kajal, Mehendi, or Bindi. The newlyweds, especially visit their home, as it is considered to be the first Teej celebrations for them. Worshiping the Neem tree is also a part of the rituals of Kajari Teej. Swings are also hung for the women and all the women enjoy the advent of monsoon and Teej festival. Singing the Kajari songs is also counted as the part of the day of Kajri Teej festival. The songs of Kajari Teej are an important part of the Teej celebrations. Women folk perform dances also on these songs. Since Teej is celebrated at the beginning of monsoon season; hence, the dance expresses the feeling of welcoming the cool monsoon showers after the hot and humid summer season. Teej is celebrated in Madhya Pradesh and in Uttar Pradesh, especially Mirzapur and Varanasi. One of the main attractions of Kajari Teej of Bundi in Rajasthan is the procession wherein the Teej Goddess is taken through the city. The procession starts from Naval Sagar in an ornamented palanquin. Cultural folk music and dance performances are held in Bundi, Rajasthan. According to traditional Hindu lunar calendar, the festival of Hartalika Teej falls on the third day of the fortnight in the Bhadrapad month. If considered from the Gregorian calendar, Hindu month Bhado falls between August to September. Hartalika Teej is celebrated to commemorate the day when Lord Shiva accepted the love of Parvati. Teej coincides with monsoon season and thus create a greater impact for its celebration. Hartalika is a combination of “harit” and “aalika” which means “abduction” and “female friend” respectively. According to the legend of Hartalika Teej, Goddess Parvati, incarnated as Goddess Shailaputri, was the daughter of Himalaya who promised her hand in marriage to Lord Vishnu, at the suggestion of Narada. Upon hearing this, Goddess Parvati told her friend of her father’s decision whereupon the friend took Goddess Parvati to the thick forest so that her father would not marry her to Lord Vishnu against her wish. On the third day of the bright half of Bhadrapud, Goddess Parvati made a Shiva lingam out of her hair and prayed. Lord Shiva was so impressed that he gave his word to marry Goddess Parvati. Eventually, Goddess Parvati was united with Lord Shiva and was married to him with her father’s blessing. Since then, the day is referred to as Haritalika Teej as Goddess Parvati’s female (aalika) friend had to abduct (harit) her in order for the Goddess to achieve her goal of marrying Lord Shiva. Women gather in a place to install the idol of Ma Parvati and offer flowers, fruits, sweets, ‘sindoor’ or Vermillion. One or two persons read out the Teej Vrat Katha. Unmarried girls also devotedly listen to the Katha. In some places, after the ‘puja’ women follow the custom of bathing themselves with mud around the Datiwan plant to be rid of their bad karma. A very important ritual is to light an oil lamp that is supposed to be lit uninterruptedly through the night. Some women do ‘vrata’ or fast by consuming only fruits and some do ‘nirjala’ Vrata without a drop of water and also refrain from sleep. Women apply ‘mehendi’ (floral patterns made with henna paste) on their hands and feet, wear beautiful sarees with matching bangles and ornaments on this day. Teej dance imitates the beautiful dance of the peacock during the rains. Women take turns while singing in swings bedecked with flowers. Songs that are paeans to the monsoon season and marital happiness and others that are reminiscent of lovers’ woes of separation are sung. The festival is celebrated for 3 days. The first day of Teej is called Dar Khane Din. 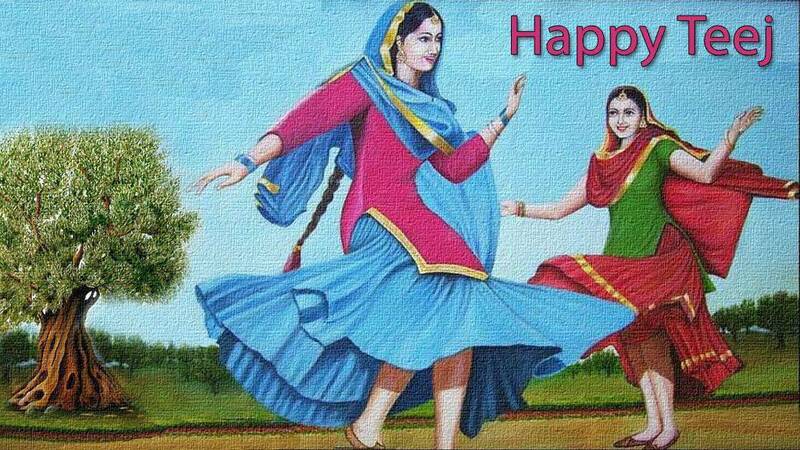 On this day the women assemble at one place in their finest attire and start dancing and singing devotional songs. Amidst all this, the grand feast takes place. What is unusual about this day is that the feast is hosted by men. Women, who work hard throughout the year, do not have to do anything that day. That is the day for them to embellish themselves in sorha sringaar — dressing up and using makeup to the full extent, indulge in good food, and dance. Oftentimes, because women are invited by multiple brothers for the feast, they try to dance off some food before they are ready to eat more. The food served is supposed to be rich and abundant. This is probably the only day in a year that allows women full freedom of expression. Consequently, women have traditionally used this occasion to express their pains and pang in the songs they sing while dancing. With the advancement of communication and awareness, women these days use this occasion to voice their concerns about social issues and discrimination against women. The jollity often goes on till midnight, after which the 24-hour fast starts. The second day is the fasting day. Some women live without food and drops of water while others take liquid and fruit. Married women abstain strictly from food and drinks with a belief that their devotion to the God will be blessed with longevity, peace, and prosperity of their husband and family. Unmarried women observe the fast with a hope of being blessed with a good husband. They dress gaily and visit a nearby Shiva temple singing and dancing on the way. The Pashupatinath Temple gets the highest number of devotees. At the temple, women circumambulate the Shiva Lingam, which symbolizes Lord Shiva, offers the praying with flowers, sweets, and coins. The main puja (religious ceremony) takes place with offerings of flowers, fruits, etc., made to Shiva and his wife goddess Parvati, beseeching them to grant their blessing upon the husband and family. The important part of the puja is the oil lamp which should be alight throughout the night. It is believed that by the light of an oil lamp all night will bring peace and prosperity to the husband and family. The third day of the festival is Rishi Panchami. After the completion of the previous day’s puja, women pay homage to seven saints or sages, offer prayers to deities, and bathe with red mud found on the roots of the sacred datiwan bush, along with its leaves. This act of purification is the final ritual of Teej, after which women are considered absolved from all their sins. Recent years have witnessed an alteration in the rituals, especially concerning the severity, but its essence remains the same. In olden days the women traveled less to their parents’ home, their freedom of speech was the bare minimum. So this festival allowed them to dress up, go to their parent’s home and express their joy or sorrow and bond with their siblings. These days women do have certain freedom compared to before but the fact that women’s wishes are still not considered is still sad. Some women are atheist and don’t believe fasting for their husband might bring them long and healthy life. The Social stigma against the windows is also clearly visible since they are not allowed to participate or get decked in red. Some women feel the pressure to buy new clothes jewelry for the occasion. Some women suffer health issues due to overheating prior to the festival and dehydrate themselves by not consuming water on the day of festivities. So it is up to each one to enjoy the festival and revere the Gods and acquire a healthy lifestyle than blindly follow the crowd.